Use With Trac-Lock™ Locking Swivel. Springfield Trac-LockIII 2- 7/8". 6 1/2" square base, 3 1/2" high. 12 available. Seat shell manufactured by Springfield Marine. 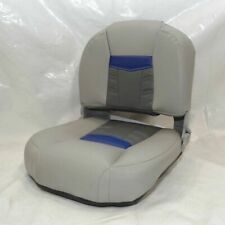 This folding boat seat has a gray, dark gray, and blue exterior vinyl cover with soft foam padding. - Quality Springfield Marine seat shell. We are not bound by typographical errors resulting in inaccuracies with regard to prices, product specifications or availability. Size-2-7/8" dia., ABYC-AD. 7-1/4" x 13" Seat mounting platform. Springfield 1642005 Spring-Lock Seat Power Pedestal 13 1/2"-20"
Springfield's "Spring-Lock" power pedestals use a unique design utilizing compressed gas to adjust pedestal height. 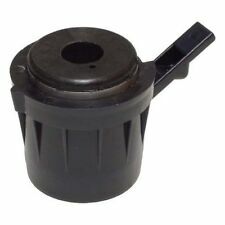 Fits "Spring-Lock" base 1640002. Two sizes available for any application. Boat part number 1076957 is a new Taper-Lock™ Hi-Lo seat pedestal from Springfield Marine, part number 1600427. Part Number: 1600427. All Taper-Lock Series feature a taper that allows pedestal to fit snugly and disengage as needed. Part #2100032. Pedestal Bushing. Springfield Marine. 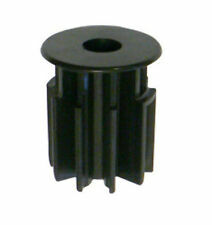 Bushing Adapter for Taper-Lock Pedestals. Order #3731002. Part #2171004. Springfield Marine. Order #3731124. Boat part number 1021917 is a NEW in the box Springfield Marine Manual Portable Toilet. Springfield #1810100. This bone colored, self-contained portable toilet has a 2.64-gallon freshwater tank and a 2.8-gallon wastewater holding tank. Flip-Up Capt Seats. Springfield Marine Capt. Seat. Springfield part #3620402-P. 3/4" pin works with all Springfield Marine Kingpin Bases. Manufacturer: Springfield. We're your port for thousands of hard to find boat parts, original manufacturer's parts and marine surplus. Part Manufacturer: Springfield. We're your port for thousands of hard to find boat parts, original manufacturer's parts and marine surplus. Check out this deal! Hardware and instruction / installation manual not included. Manufactured by:SPRINGFIELD. 2-7/8” table mount. Manufacturer's Part Number:3660207. Boat part number 1042608 is a new KingPin 3/4" spring loaded boat seat mount base, manufactured by Springfield Marine, part number unavailable. 7" x 7" swivel with spring. Polished finish. Fits 5" x 5" seat mount pattern. Boat part number 8101789 is a NEW, out of the box, standard Kingpin seat base from Springfield, part number 3620016. Part Number: 157812. Part Mfg: Springfield Marine. We're your port for thousands of hard to find boat parts, original manufacturer's parts and marine surplus. This is a 2-piece seat with removable snap-on cushions. - Springfield Marine #1061301. We are not bound by typographical errors resulting in inaccuracies with regard to prices, product specifications or availability. Boat part number 1041233 is a new table top from Springfield Marine, part number 1670007-B. Part Manufacturer: Springfield Marine. We're your port for thousands of hard to find boat parts, original manufacturer's parts and marine surplus. Boat part number 1077612 is a new bolster seat from Springfield Marine, part number unavailable. Part of the Thigh Rise seat style. This bolster seat is constructed from navy blue colored marine grade vinyl with white piping over high density foam and poly-carbonate shell. Mossy Oak Folding Seat. Now a comfortable cushioned seat to support your backside. 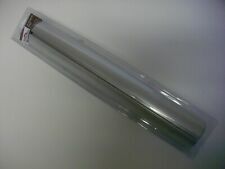 Poly vinyl amber rollers are long lasting, will absorb shock, are cut resistant and will not mark or mar your boat. Marine Grade. Springfield 1642008 Spring-Lock Seat Power Pedestal 25 1/2"-29 1/2"
3 out of 5 stars - Springfield 1642008 Spring-Lock Seat Power Pedestal 25 1/2"-29 1/2"
1 product rating1 product ratings - Springfield 1642008 Spring-Lock Seat Power Pedestal 25 1/2"-29 1/2"
Boat part number 7500540 is a new KingPin seat base from Springfield Marine, part number 3620018-LB. Commonly used on G3 Boats, part number 73583059, but may be used on other boats. Boat Manufacturer: G3. Manufacturer PN : 1611433. Shelf: TO LC 0728. BIN: C17 LC 12675-1478. Quik-Tilt Seat Mount. Gray Pro Stand-Up Seat. (4) Credit card, cash, check (depends on the ordered item) at pick up. FREE LOCAL PICK UP. Part #2100038. Springfield Marine. Wooden mandrel for tapping in new bushing. Floor Base. Repair Kit. Springfield Manual Adjustable Pedestal with Seat Mount. 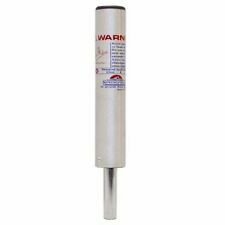 Poly vinyl amber rollers are long lasting, will absorb shock, are cut resistant and will not mark or mar your boat. Adjusts From 13" to 16". Trac-Lock Non-Locking Swivel. Trending at $71.38eBay determines this price through a machine learned model of the product's sale prices within the last 90 days. 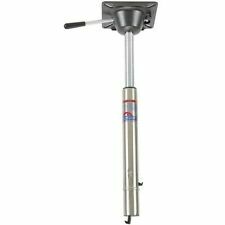 Boat part number 1071755 is a new Taper-Lock power rise adjustable seat pedestal with non-locking swivel mount from Springfield Marine, part number 1602024. Part Number: 1602024. This taper lock adjustable power rise pedestal is constructed from aluminum with a 3/4" Dia. Springfield King Pin Anodized Power Pedestal - 22" to 29"
The Springfield King Pin Anodized Power Pedestal works with any Standard King Pin base (not included). The power pedestal's height can be adjusted to be be used as a seat or leaning post. Rotates 360 degrees Rust-resistant anodized finish 5 Year manufacturer's warranty . Part #1620005. Kingpin Deck Base. Springfield Marine. Stainless Steel. Stainless Steel. 4" x 8" Stainless Steel. 3/4" Center Hole. UPC: 038132430051. Boat part number 1041240 is a new seat pedestal base from Springfield, part number 3300750-SML1. Part Manufacturer: Springfield Marine. We're your port for thousands of hard to find boat parts, original manufacturer's parts and marine surplus. OFF WHITE IN COLOR WITH A REMOVEABLE PLUGGED HOLE FOR A UMBRELLA STAND (UMBRELLA NOT INCLUDED). UMBRELLA TABLE. STAND - 8100002. BASE - 3660004-SM. TABLE - 1670002-U. This is a heavy duty aluminum pedestal. This is a new pedestal in the factory box. Trac-Lock™ Locking Swivel. Up for sale is a Springfield Marine Kingpin offset stainless deck base part number 1630003. Below The Deck Mount Requires A 2-1/2″ Hole In Deck. Springfield EZ-Ride Wave Dampening Pedestal Package -The 2-7/8'' EZ-Ride Package includes: -2-7/8'' EZ-Ride Pedestal -2-7/8'' Locking Trac-Lock Swivel -Allows 3-1/2'' Of Vertical Travel -9'' Round Floor Base -4 Grooves with 4 Keys Provide Rotation Lock and Restrict Movement. Part Number: 1600615. Part Manufacturer: Springfield Marine. We're your port for thousands of hard to find boat parts, original manufacturer's parts and marine surplus. Check out this deal! Springfield Ladder Back Chair - Never Used! Due to size and weight, local pick-up preferred. (part # not available). We're your port for thousands of hard to find boat parts, original manufacturer's parts and marine surplus. Check out this deal! The thread size is 3/4 - 10. Grill w/trailer hitch mount, Cooking Area-189 sq. in. 1940057 Converts to Table-Top Grill. 13" POLISHED PEDESTAL NON THREADED. SPRINGFIELD MARINE EXTENSIONS. SWIVEL/SPIDER W/3/4" PIN. FREE S&H LOWER 48 STATES. Boat part number 8301435 is a new plug-in seat base from Springfield, part number 1300750-1. Commonly used on Lund Boats, part number 1868223. May be used on other boats. Mounts with (6) 5/16" dia. Normalized SKU: 2171001. 2-7/8in Bushing For 2-7/8in Trac-Lock Swivels. Boat part number 1052939 is a new 2-piece seat slide rail from Springfield Marine, part number unavailable. Part Manufacturer: Springfield Marine. These seat slide rails are constructed from black power coated steel, and travel 6". Springfield 2100010. Seat Mount Bushing /. At checkout, choose the one best for you. Boat part number 1038893 is a NEW out of box, Springfield seat swivel. Manufacturer: Springfield. Swivel lock handle operation. We're your port for thousands of hard to find boat parts, original manufacturer's parts and marine surplus. Boat part number 8102928 is a new OEM 2 piece removable seat mount from Springfield Marine, part number 3100378. Part Number: 185969. Model: Nitro Z18. Part Manufacturer: Springfield. We're your port for thousands of hard to find boat parts, original manufacturer's parts and marine surplus.